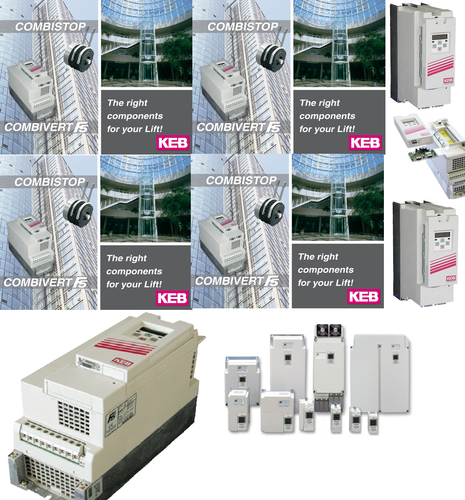 KEB COMBIVERT F5 - Elevator driveFor over 20 years KEB has supplied the lift industry with high quality frequency inverters. Over 75,000 KEB systems have been installed in elevators and escalators. KEB elevator drives are found in high rise residential buildings as well as in 5-star hotels on the Côte d'Azur. Whether in Times Square in New York, the German Federal Chancellery or at housing developments in Shanghai, millions of people use elevators on a daily basis, which are controlled by KEB inverters. KEB continues with this success story and has introduced the 4th generation of KEB lift drives the KEB COMBIVERT F5-Lift. The modular configuration allows operation with various encoder feedbacks – optimally and flexibly adapted to the respective machine. Even the Open-Loop-Performance (asynchronous machines without encoder feedback) delivers excellent ride comfort and floor leveling independent of load. digital outputs for brakes, contactors, etc. Take advantage of our experience and try the F5 Lift today.